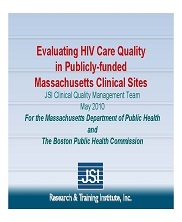 The Boston Public Health Commission selected JSI to provide ongoing services to the Ryan White Part A funded HIV/AIDS Service Providers. 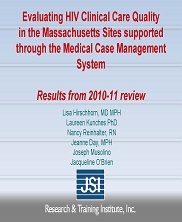 Specific responsibilities included conducting clinical chart reviews and analysis of quality performance indicators across 10 sites, and reporting on trends in care quality, health disparities, and sub-population experiences. 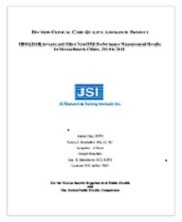 Reporting included semi-annual submissions to both Part A and Minority AIDS Initiative program managers, as well as presenting findings to the Eligible Metropolitan Area (EMA) Planning Council. The project also conferred a broad mandate for JSI to develop innovations improving the outcome tracking system deployed at up to 47 service provider agencies.